Cucumbers are botanically classified as a fruit, although they are typically perceived, prepared and eaten as though they were vegetables. Cucumbers, which belong to the same plant family as pumpkin and watermelon, are made up of 95 percent water, making them an ideal hydrating and cooling food. Its origin can be traced down to South Asia but is grown in other parts of the world too. As cucumbers contain many essential nutrients such as Vitamin A, Vitamin B, Vitamin C, Vitamin K, Manganese, Copper, and Potassium, incorporating cucumbers in your daily diet can lead to excellent health benefits. The following are health benefits of eating cucumbers. Trace elements of potassium and magnesium play an important role in maintaining a healthy heart by helping to keep your blood pressure under control. Cucumbers also contain lignin, which is referred to as an anti-inflammatory element that helps boost immunity and reduces the occurrence of problems associated with cardiovascular disease. Because cucumbers are so low in calories and high in fiber it makes them extremely useful in the fight to lose weight. There are many ways cucumbers can be enjoyed: raw in salads as a side with meals, fermented as a pickle or in vegetable juices. Cucumbers aid the liver to eliminate impurities, waste and accumulated toxins from your blood and gut. They also help the body to pass out more urine in order to remove toxins. Drinking cucumber beverages can speed up the detoxification process, and are often included when people are ‘detoxing’. Cucumbers contain fisetin, caffeic acid, cucurbitacins, lutein and the phytochemicals in cucumbers have been found to have potent anti-cancer properties and help to eliminate free radical cells and boost immunity. Consumption of the vegetable can reduce the occurrence of breast, ovarian, prostate, uterine and lung cancer due to the presence of flavonoids such as fisetin and caffeic acid. Cucumbers are rich in water and their skin contains insoluble fiber and enzyme ‘erepsin’ which can improve digestion and helps the body adequately absorb protein. 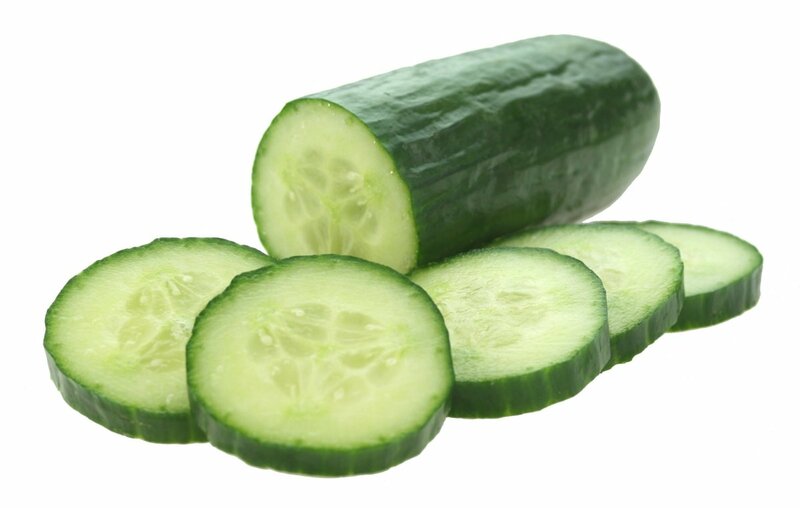 Pectin in cucumber facilitates the normal flora of the intestine. It also manages the bowel movement and softens the stool due to its high water content, which helps treat constipation, gastritis, ulcer and many other stomach related disorders. Fiber and water-rich vegetables like cucumber can boost your mouth’s saliva production which in turn helps wash away bacteria that cause mouth odor. Physically placing cucumbers over your eyes can help to moisturize the skin around the eyes as they contain 95% water. They act as natural anti-wrinkle agent and there help to combat the early signs of wrinkles. They Vitamin C present can also help to lighten skin tone. Studies have found it effective in reducing oxidative stress and preventing diabetes-related complications. The presence of magnesium, fiber, and potassium in cucumbers makes it effective in regulating blood pressure. It also helps lower the pressure in arteries and keeps them hydrated. Cucumber contains ascorbic acid and caffeic acid, both of which help strengthen your body’s ligaments, cartilage, tendons, and bones. The vegetable also contains silica which helps in the formation of connective tissue which helps strengthen weakened bones. Fisetin, present in cucumbers plays an important role in brain health as it possesses the ability to reduce the impact of age-related neurological diseases on brain function. It also helps maintain cognitive function in people with Alzheimer’s disease.